Al played quarterback for the varsity football team at San Leandro H.S. 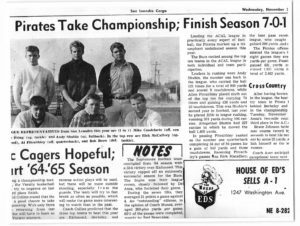 during the fall of 1964 and 1965 under head coach John “Biff” Crawley and his assistants Woody Daley, Cas Munoz and Ben Shorum. “Coach Crawley was a great man and great coach,” recalls Al. The teams were jam-packed with superior talent on both offense and defense – guys like Andy Shubin, Rick McCaffery, Mike Candalerio, Bob Brow, Jerry Skaggs, Keith Depolo, Phil Baylesss, Steve Pring, Ron Lorensen, Keith Meitz, Mike Lucia, Dennis McClure, Cliff Wilson, Jack Stokes, Larry Podesta and many others. 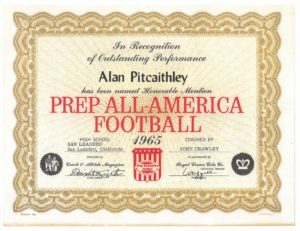 The 1965 squad had a least 6 or 7 players that were selected All-League First Team both years. The team went undefeated in league play for two years straight, with their only loss a non-conference game to Bellarmine Prep School (Bellarmine was rated #1 in the state in 1965). 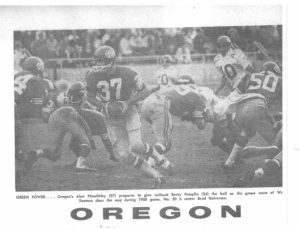 The Pirates would have beaten Bellarmine except that an end-zone touchdown pass that Al threw to Jack Stokes late in the fourth quarter was called out of bounds.